Technology companies always have a unique approach to doing business. The best ones are constantly evolving their products or services, embracing change, staying persistent, and taking calculated risks on the road towards success. The tech marketplace is so competitive that it’s simply not enough to hire smart employees and hope for the best. To make progress as a tech company, you and your employees have to be willing to make sacrifices for your vision. In today’s ultra competitive tech industry, it’s important to be creative and focus on adding as much value as possible into consumer’s lives. Without that mindset, many technology companies fail. It’s also vital to understand that the business world is a results driven environment. Your business is only as good as it’s results. Promotional products fit into a technology company’s game plan quite well. Even the most sophisticated technology companies can buy into the simple concept of using promotional products to increase brand recognition. The strategy is straightforward. Find a useful promotional product that adds value to consumers, print or embed your logo onto said product, and distribute the products to anyone you’d like to remember your brand. This can be a great strategy for raising brand awareness for both startups as well as established technology companies. In some ways, promotional products are the most effective marketing approach, particularly if they are marketed correctly toward your business’s ideal target market. A great example of a tech company achieving stellar results by using promotional products to market their business is the story of New Relic. This tech company offers a data driven analytics platform to help improve any software or applications that you are using for your business. They want as many people to sign up and try their platform out as possible, so they decided to incentivize potential customers by using promotional products. If you sign up for a trial of their platform, you receive a free customized t-shirt of your choice, along with trial access to their product. New Relic shipped over 75,000 shirts in 1.5 years after implementing this promotional marketing strategy in 2012. Talk about great exposure for your brand! Promotional products can clearly elevate your business to another level and encourage potential clients to take interest in your cause. A story like New Relic’s is inspiring and shows that with a little bit of creativity and a great promotional product, you can drive great marketing results for your technology company. If you are interested in apparel related promotional products for your own business, iPromo can help you through the design process to improve your brand recognition and provide your company with free advertising. Take a look at our huge variety of promotional apparel products, including many different types of T-shirts. When you think about it, everybody can use another pair of socks. That was the thought process for technology startup IFTTT, a company that offers a service which combines your favorite applications and websites and allows you to set up custom rules to increase productivity. IFTTT is different from most tech companies, and they wanted their promotional product to reflect that. They researched trending products and found out that full color custom socks were the perfect eye catching promotional product. They are stylish and people are happy to wear them. that helps differentiate their brand. IFTTT’s iconic tri-colored argyle socks represent what their platform does and has helped separate this tech company from other technology companies competing for consumer attention. Taking an original promotional product like socks and making it a representation of your business values and mission can be a great way to spread the message about your company. Custom socks and other apparel promotional products can really be a great way to promote your business. Technology companies and startups tend to have a reputation of having a quirky company culture and providing an enjoyable work environment. A great example is Twitter, the social media giant. 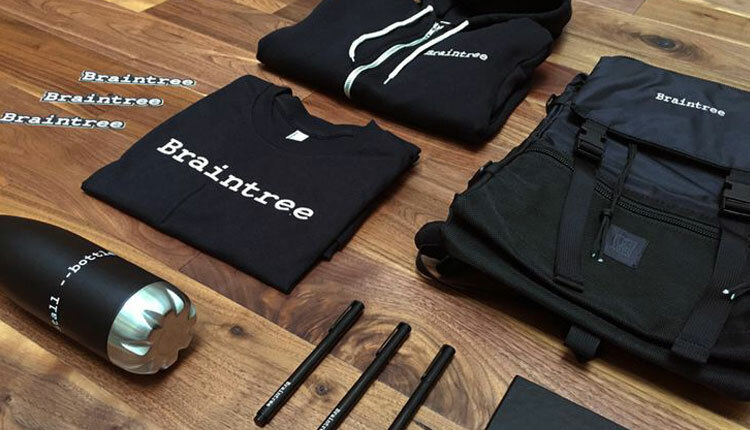 Each time a new employee starts working for Twitter, they receive a “welcome swag bag” that includes a personalized bottle of wine, a tote bag, a laptop sleeve, a t-shirt, and a notebook. All of the items are adorned with the company’s logo, the infamous blue bird. The welcome swag bag is a great way to put a smile on new employee’s faces and in return they feel an instant connection to the brand and proud to be part of the organization. Putting together a swag bag for your new employees is a great way to start them off on the right foot. iPromo can help you select the items that will make a lasting impression on your employee’s first day. A custom laptop sleeve is always useful, especially for tech companies. Tablets are also a big part of work-life for tech employees, which means a Tablet Tote Bag would be well received. You also can never go wrong with custom Notebooks to help your employees put their thoughts and ideas to paper. As we mentioned earlier, Twitter employees receive a bottle of wine in their swag bag. If you’d like to add wine related items, you can’t go wrong with choosing from iPromo’s great selection of wine accessories. These tech companies are just a few of the many out there making a creative impact with promotional products. It’s proof that the tried and true strategy of using promotional products to increase brand recognition and buzz about your company still works quite well today. If you’d like to discuss which one of iPromo’s custom promotional products is best for marketing your technology company, please contact us today!